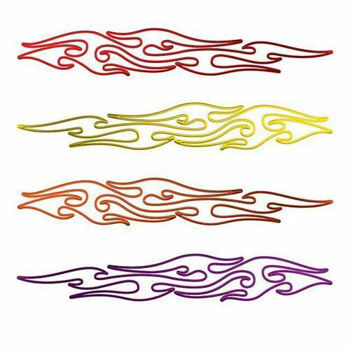 Pin Stripe Thin and Long Tribal Flame Decals work great for just about anything. With sizes from 12" up to 96" you can trick out anything from a toy truck to your full size pickup or car. 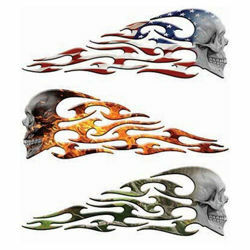 Way easier to create a pin stripe design when it's already to go for you. This would be a huge hassle with a regular roll of pin stripe. Designed and produced in house using the the best materials and newest processes available. Using the newest printing technology with a 7 color process these graphics pop in color and are highly detailed. New inks also extend the life of the graphic for years to come without any fading. Our graphics are safe to clear coat over if you want to but it is not required. They are easily removable without harming paint should you want to remove them and change to something different. The Reflective graphics are made from the same materials used on emergency vehicles, our reflective products look just the same as the non reflective designs during the day but at night when light hits them they reflect grabbing your attention. 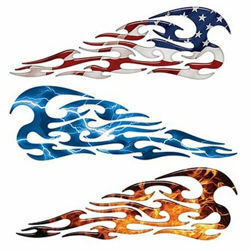 With our special translucent ink reflective process all the color within the graphic reflects. It's a great attention grabber for your vehicle as well as a great safety feature at night.